Professor Roland Ironsphere was working in his secret laboratory one stormy night when a bolt of lightning struck the laboratory and transported him into one of his own experiments. He is now trapped in an iron sphere and must traverse 100 hazardous screens collecting diamonds. At least one diamond must be collected from each screen in order to win, but if you don't collect all of the diamonds on a screen, they will turn into bombs the next time you visit. Your sphere's power is also limited and will need to be recharged regularly, so you must try to learn where recharging points are located. The concept is extremely simple, but this is a nice little game which is fairly addictive as well and has that 'one more go' factor. 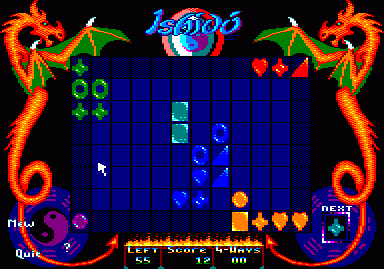 Ishido is a puzzle game and its title means "The Way of Stones". It is a tile-matching game where you need to match colours and symbols in order to score points. The graphics are well drawn; there is a satisfying degree of detail and the colours used produce nice visuals. The sound is good too. The in-game tune, in conjunction with the graphics, creates a Far East atmosphere. The background is dominated by dragons and Buddhist symbols. 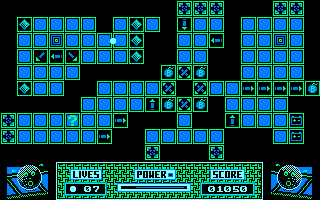 The gameplay is pleasant and rather simple, but the player should be careful not to make mistakes because they cannot be easily corrected. Thus, the challenge level is quite high. The grab factor depends on whether you decide to progress, or just resign from the start. If the answer is the former, then Ishido will grant the player many pleasant and challenging moments. In seven days' time, Dr. Destructo is going to destroy the world, and the only way you can prevent this is by sinking all his ships, by shooting planes and helicopters out of the sky so that they fall on the ship. 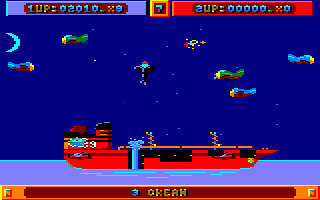 In later levels you'll also come across islands and even a space shuttle. The game has a cartoon theme throughout with some beautifully colourful graphics, and it's amazing to witness the sky changing as day turns into night and back again! The sound effects are great, too – lots and lots of noise! This is a brilliant game and a great way to let all that tension out. Watch YouTube videos of this game by: Novabug, Xyphoe. Colonel-in-Chief Matt Ridley was bored with his desk job, and decided to enter the Sangfalmadore Run – a training arena and maze that has now become unstable. However, he has become totally lost, so you have been sent to rescue him in your Incredible Shrinking Sphere. The arena consists of four levels, which in turn consist of four plates stacked on top of each other. Each plate is made up of tiles, some of which affect your sphere in different ways, making it smaller or larger, or lighter or heavier. You can also make the sphere invulnerable for a long time, allowing you to save ammunition. 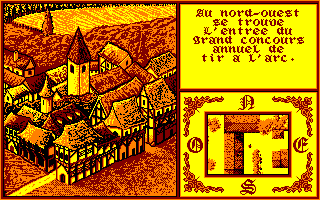 There is a strong puzzle element to this game, which I like, and the isometric graphics are good. However, the action is a bit slow, and it is really annoying having to go back to the very start of the level if you lose a life. Like one of Code Masters' earlier games, Super Stunt Man, you have been hired by a film company to drive a fast Italian sports car for some action-packed thrills in a new film. This time there are five scenes, including another jump across the Grand Canyon. As before, cars and helicopters also take part in the film to impede your progress and make life difficult for you, as well as shooting at you. Many scenes also contain mine sites, so you must be careful where you drive. The graphics have been improved considerably and the music on the menu is also good, but the gameplay has worsened; it's simply too difficult. There are too many obstacles and the time limit is too small. See also: Super Stunt Man. 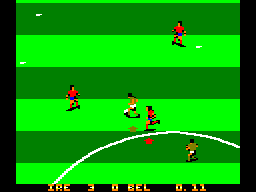 Recreate the 1990 World Cup in this fantastic football game. Choose your favourite team out of the 24 available and attempt to reach the World Cup final. It's obvious that great care has been taken with this game; it's fast, the music is great, and the graphics are wonderful, particularly the players themselves, who even wear the right colour of kit for their country – you don't find that in many football games! 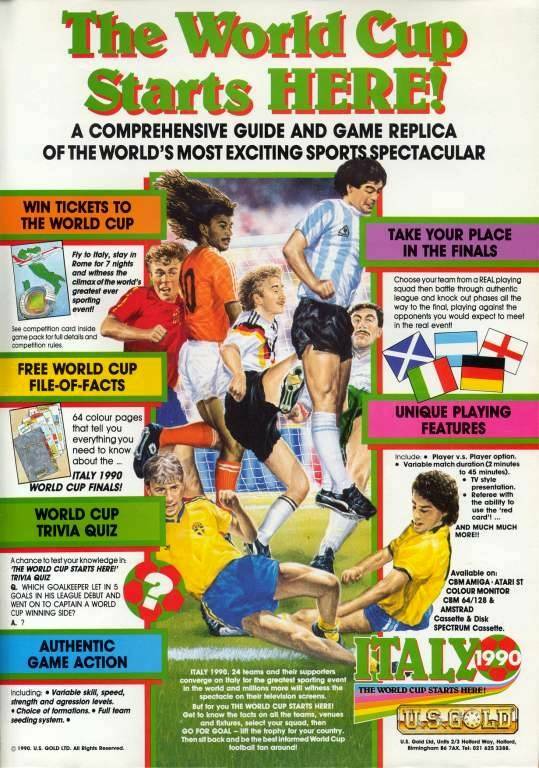 The only problems are that it's too easy to win against the computer, and when you do win the final, there's a bug which tells you that the losing team won the World Cup (which was corrected in a later release – Italy 1990 Winners Edition). It's still great fun, though. Watch YouTube videos of this game by: ChinnyVision, jgonza, Xyphoe. It's a Knockout is based on the 1980s TV show of the same game. Six European countries compete in six mini-games where you have to score as many points as possible. The games on offer are mostly simple affairs with hardly any grab factor. The joystick controls are a little sluggish at times, making some of the games very tricky indeed. 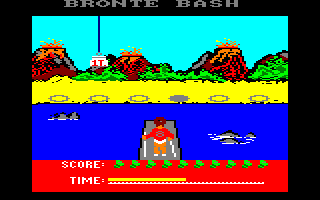 The visuals include poor presentation and crude-looking graphics, with only a few sound effects to liven things up. Once you complete the competition you'll look for something better to play instead. 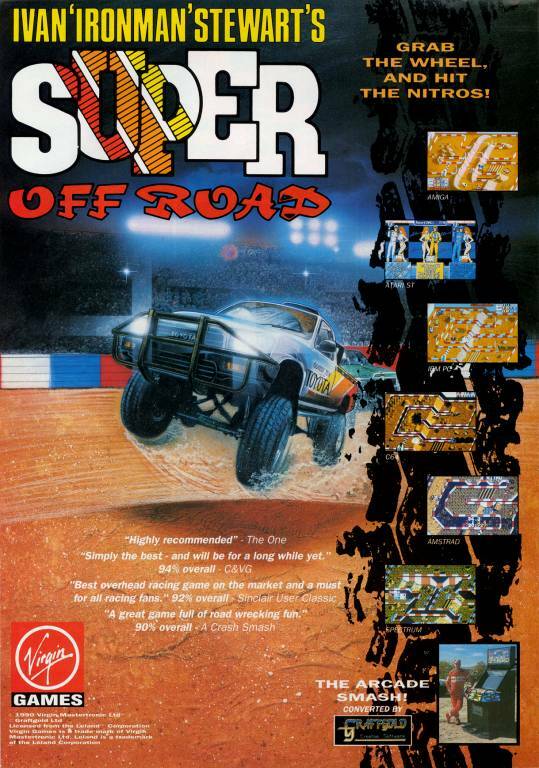 Race around dirt tracks in massive, overgrown trucks against three other competitors and be the first to complete four laps of each track – if you don't, you'll lose one of your three lives. The trucks are very difficult to control and seem to have a mind of their own, and they ricochet off the barriers as if they were rubber balls! The tracks are also very bumpy, which doesn't help matters either. Prize money is allocated to the top three finishers at the end of each race which you can use to buy extra equipment, including nitros which give your truck a temporary boost of speed. 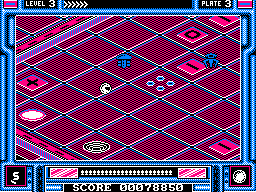 The graphics are fairly simple but clear, while a short, but very catchy, tune plays throughout the game. 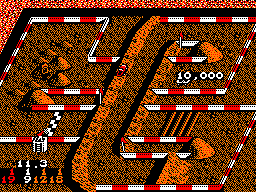 All in all, it's a fairly good game, although there aren't very many tracks. Watch a YouTube video of this game by: Novabug.